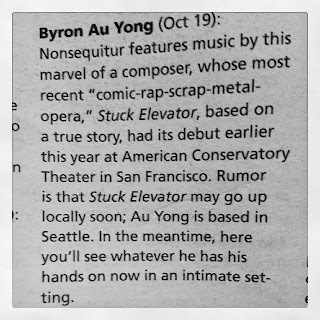 New songs from the exquisite and off-kilter mind of composer Byron Au Yong. Au Yong also takes inspiration from the fact that the performance space was once an orphanage and home for unwed mothers and “at risk” girls. In the music, you might hear echoes of the old laundry—blankets being folded, stones being rubbed on water. And love letters being crumpled. Au Yong is personally “in a difficult place with love,” he says. And on the flip side, “As an artist, he has a lot of love to share,” says Tiffany Lin, the pianist, who has worked with Au Yong before. He tends to inspire loyalty for his thoughtful approach integrating classicism with improvisation, spiritual and emotional exploration with preparedness and rigor.